A gentleman's watch like this 18-karat gold pocket watch belonging to the university's namesake, Judge Robert Emmett Bledsoe Baylor, would have been a treasure to a man living in a country still considered wild frontier land -- and judging by the light wear on the case, it was not carried often. Most likely, it spent more time in a display case as a valued family heirloom than in a pocket as a portable timepiece. It stayed a well-cared-for heirloom for more than 125 years, being passed from generation to generation in the Baylor family. Since R.E.B. Baylor had no children of his own, the first to inherit the watch was his nephew, John R. Baylor, a Confederate brigadier general famous for capturing and governing the New Mexican territories during the Civil War. After the war, John came to Texas to stay with his uncle. At some point during the visit, Judge Baylor imparted this prized possession to his nephew. Many Baylor generations later, Edward R. Baylor relinquished the heirloom and generously donated the watch to the university's Texas Collection. The watch has a fusee movement that still keeps surprisingly accurate time approximately 200 years after its manufacture. The watch works were made by an English watchmaker named Joseph Johnson of Liverpool, who was known for exporting many watches to the United States, most notably making many of the watches used by U.S. railway conductors during the early 1800s. The date of Judge Baylor's actual watch is unknown, but the gold carry case bearing the maker's mark "S.H. of Chester" is dated 1802. 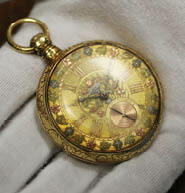 The university acquired the watch in 1990, and it is now part of the Texas Collection, Baylor's oldest special collections library. The largest Texana collection at any private university, the Texas Collection includes hundreds of thousands of books, periodicals, photographs and other documents and files, all dealing with Texas and Texans. In 2007, it was also designated as the university's official archive. For more information, visit www.baylor.edu/library/texas.